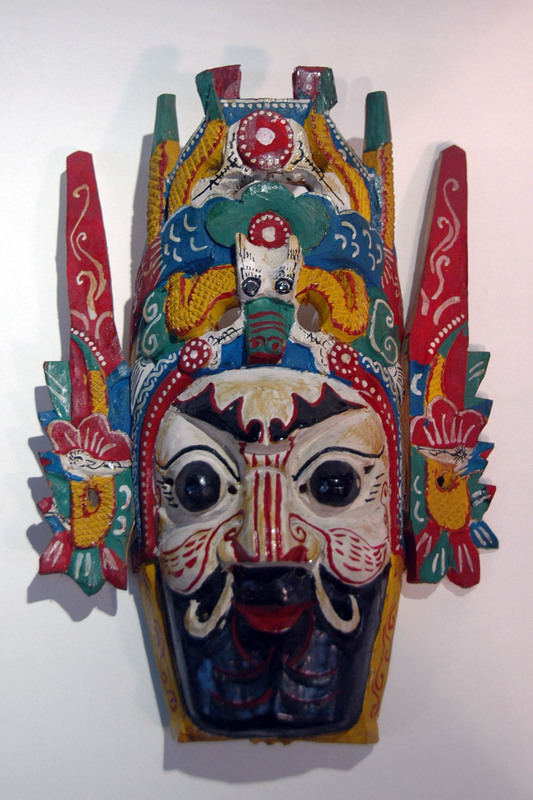 This is a mask of the Di Xi (Ground Opera); this form of opera is practice by the farmer villages in Gui Zhou area. The folks will perform the opera passed on by the previous generation on Chinese New Year for around 20 days. Unlike the other mask dances in China, apart from deterring away the evil spirit, the Di Xi only consist of fighting or war themes. This specific themes can be explained by the its history; in early Ming dynasty, tribal attacks along the border and by Mongols from the previous dynasty has not be settled. Military base were formed in the Gui Zhou area, these soldiers were known as the fort men (Tunpu), Di Xi was their opera, a way of introducing military and culture into the rural area. Ceremony will be performed for the blessing of the mask, before the masks are blessed they are appreciated merely as wood carving objects, however once the blessed with prayers and scattered with the blood of a rooster they became sacred. The Di Xi masks are also worn differently from other Nuo masks; performers would covered their head with black muslin and wear the masks on their forehead. The mask in the photo is General character, the colourful ornament on his head is in fact a helmet.